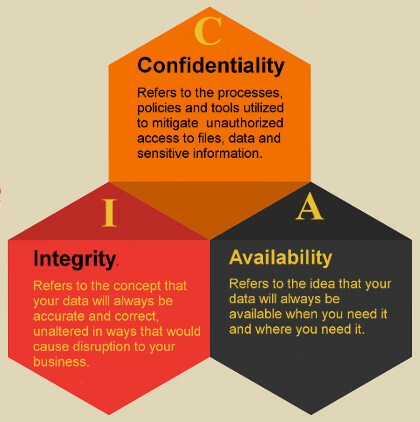 In this four-part blog series, we’ve written about the Confidentiality, Integrity and Availability of your company’s data as the three lynch-pins of corporate IT security. We’ve already blogged about Confidentiality and Integrity, and in this final installment will address the Availability aspect of network security. As you and your employees go about your business throughout the day, you’ll touch on a wide variety of data types. In the typical small business, you will need access to your company’s Line of Business application, word processing documents and spreadsheets, email, Internet-based applications, and perhaps accounting, image editing, and other highly specialized data generated by applications specific to your industry. The inability to access any of those data sources could disrupt your business for at least as long as the data remains unavailable. Imagine that the important quotes you’re working on are in documents on the server and the server goes down. How disruptive would it be if you couldn’t send or receive important emails to customers or vendors or access important web sites for research because of bandwidth bottlenecks or the loss of the Internet entirely? What happens when the Line of Business application’s database becomes corrupted or encrypted by a nasty virus like the Cryptolocker virus that encrypts files and demands a ransom for the decryption key? How can you prevent or minimize those incidents from becoming disasters? If you can’t access network resources like your server or the Internet because of a failed server hard drive, or a failed router, modem or firewall, the Availability of your data suffers. What would happen if a natural disaster or a fire destroyed a significant part or all of your business? What can the typical Sussex County small business do to mitigate the risks and the damage associated with such events? For the most extreme disasters involving a long-term (more than a couple of days) loss of availability, have a Backup and Disaster Recovery Plan in place to get the business back up and running ASAP rather than trying to plan the recovery after the fact. We’ve discussed a number of potential risks and mitigation strategies in this four-part series over the past several months. In our inter-connected world, in which your business relies on that inter-connectivity to access data critical to your operations, the data stored on your firm’s network is more at risk than ever from a wide variety of threats. More than anything, I hope you’ve gained an understanding of the risks to your data, and your company, and the steps needed to mitigate those risks, that you may not have appreciated before.